Clara’s 4th grade class is in the middle of their Halloween party right now. The first one where we parents aren’t needed to stick around. The kids had it all under control and it was even their idea to throw a healthy party. When I dropped off this platter I spotted a giant fruit salad and other healthy goodies. I’m pretty proud of them. How often are kids willing to skip the sugar? Maybe the 4th graders are teaching us something. Maybe we don’t need those sugary snacks for a fun party, just a reason to celebrate and some healthy treats. Oh course, I’m pretty sure they won’t be turning down any trick-or-treat candy Monday evening. But I’m still proud of them. I love these! They were so easy too. Print Recipe. 1. Add lemon juice to a large bowl and fill with cold water. 2. Slice apples into wedges. Soak in the lemon water for about 10 minutes. Strain and pat dry. 3. 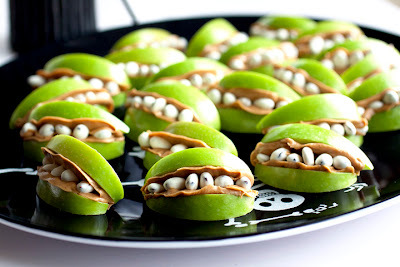 Spread or pipe peanut butter on one side of apple slices. Place a few raisins on half the apples. Gently sandwich together. These are so cute ohh... i mean scary!!! lol!!! great idea, Laura! Awesome, creative idea! I love these!! So good that they went healthy :)) These are cute! I love these! So cute, Laura! That's pretty awesome and totally the message you want to send to them about healthy food...that it can be fun as well as good for you! These are beyond cute!! What a clever idea! That's so cool that her class went for a healthy class party! =) Your treats that you made for the party are really cute. Holy cow, these are so cute! I love that they wanted to do a healthy Halloween! These are awesome Laura! Love 'em!